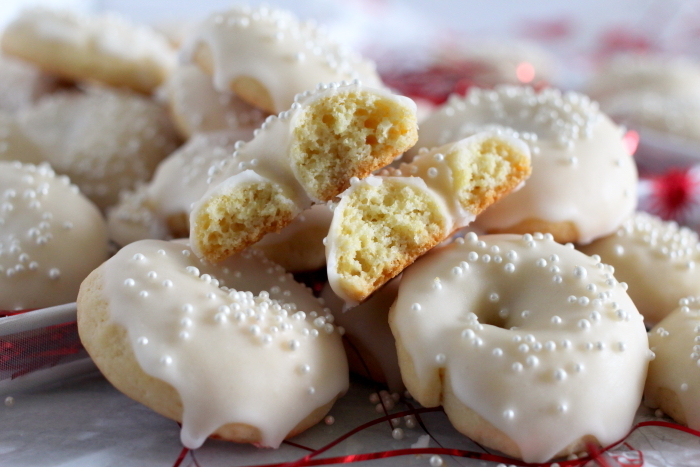 Ciambelle cookies are Italian ring shaped cookies. 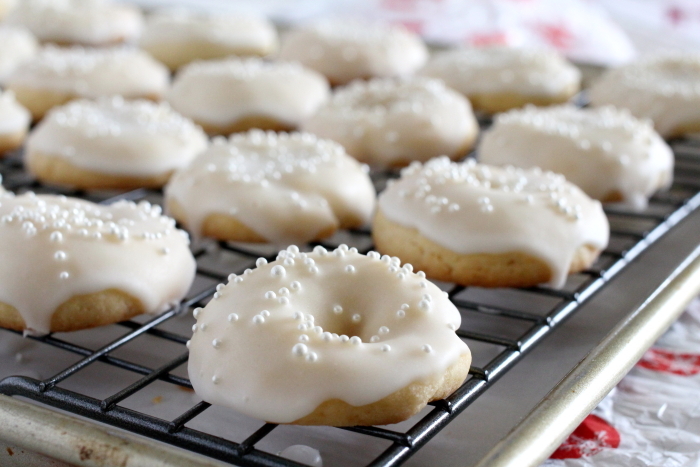 These lemon scented dainty morsels are dipped in a lemon glaze and topped with sprinkles! I hope you are all baking lots of yummy cookies and if you haven’t yet started, it’s still not too late. These are actually my third batch of ciambelle cookies and each batch yields 6 dozen cookies. Yes, I know it’s a lot of cookies! 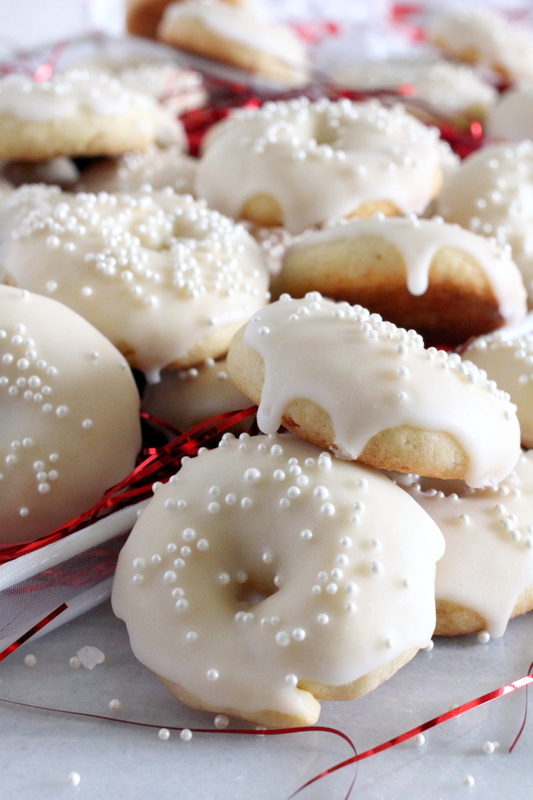 But it’s simply not Christmas without these pillowy white cookies! Besides, I really do gift a lot of my baked goods….the ones that I can pry away from my hubby that is! If you have been following my blog for a while now, you might remember that I have posted these cookies way back. It was just last Easter and I had adapted them to suit the holiday by tinting the icing with different pastel colours. 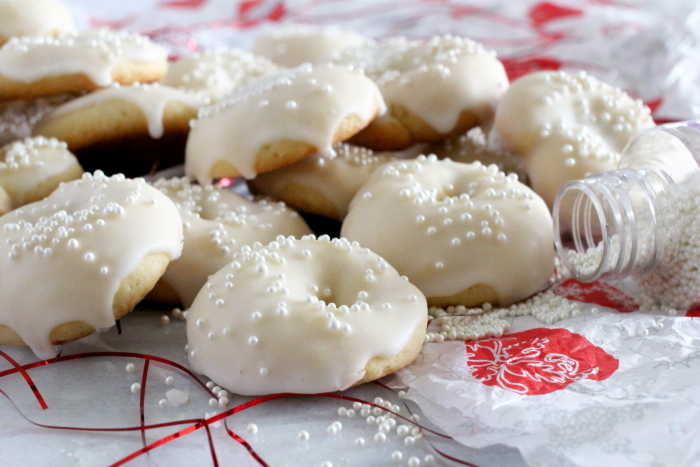 You’ll find the link here, Ciambelle, Italian Ring Cookies. They do merit a re-blog in my opinion because they are just too cute and quite delicious! And, I do believe my photography has gotten a tad better. Most Italian families have their own version of this ever popular ring cookie. From sweet to savoury or the tender to crunchy variety. There is definitely one to please every palate. These however are not overly sweet and have a lemon kick with a tender, crumbly bite. Consequently if you’re into baking ahead for the holidays, you’ll be glad to know that these cookies freeze extremely well. You can store them in an airtight container lined with wax paper in between the layers. When your ready to serve, simply remove them from the freezer and line them out in a single layer onto a cookie sheet. The glaze will have a shiny glossy and somewhat wet appearance as they thaw. Leave them to dry out on the cookie sheet and you’ll soon note them reverting back to its original appearance. These ciambelle cookies have become part of my Christmas holiday baking every year and for other special occasions! They’re a joy to make and totally irresistible! Bake them, plate them and watch them disappear! Soft Italian ring cookies scented with lemon and dunked in a lemon glaze. Using a small ice-cream scoop of about 1 1/4 inch in size, scoop out dough onto a lightly floured counter. If you don’t have an ice-cream scoop, a tablespoon will do. Roll the dough into a rope, not more than 4 inches. You can roll them on your counter but I found it easier to roll between the palm of my hands, lightly dusted with flour. Bring the ends together, slightly overlapping and pressing to form a ring. Transfer to your prepared cookie sheet and repeat with the remaining dough leaving about 1 inch space between each cookie. These cookies do not spread while baking but will expand somewhat. Bake one pan at a time in a preheated oven at 350* for about 15 to 18 minutes. The cookies should have a pale golden look when done. Transfer cookies on a cooling rack. Let cool completely before icing. Gorgeous cookies Marisa! They look so pretty and I bet they taste awesome too! Wishing you Happy Holidays! These are both lovely and yummy looking!! I looked for a reblog button but could not find one! I love this and want to reblog it! ok I will try thanks dear! Yes each family does have their own prized recipe – I love the way you decorated the icing – white on white looks so elegant. Buon Natale! Thank-you so much and to you….Buon Natale! These are really beautiful and so Holiday looking Marisa. Thanks for sharing and I have so enjoyed following you this year and look forward to many fun stories and recipes coming from you in 2016! I could not find reblog but I put it up so there it is dear Marisa! The lemon frosting for this sounds divine! These cookies sound delicious, Marisa! I love that they have a hint of lemon … one of my favorite flavors! 🙂 Will definitely want to make these! Marisa, thank you for sharing your wonderful recipe. Absolutely gorgeous! 🙂 Happy Holidays! So pretty, I think these are on the list for New Year’s! Stunning, Marisa! Such a beautiful recipe! felice anno nuovo!! I have been meaning to get back here to tell you that I made these! They were so good! And very pretty. They do freeze quite well (I ate a huge amount frozen because I couldn’t wait argh!). Thank you for sharing this! I hope you enjoyed your holidays with family! mmm. . . These cookies look awesome. Happy New Year! Thank-you Sheryl, and a Happy New Year to you…all the best for 2016? Yo también, me too ! These look delightful Marisa! Can’t wait to try them!